Need a budget-friendly new spot? Though apartment hunting can be challenging, don't despair just yet--there are deals to be had. So what does the low-end pricing on a rental in Westchase look like these days--and what might you get for the price? According to Walk Score, the neighborhood is somewhat walkable, is fairly bikeable and has a few nearby public transportation options. It also features median rents for a one bedroom that hover around $927, compared to a $1,238 one-bedroom median for Houston as a whole. A look at local listings for studios and one-bedroom apartments in Westchase, via rental site Zumper, yields a look at what budget-minded apartment seekers can expect to find in this Houston neighborhood. This one-bedroom, one-bathroom apartment, situated at 9900 Richmond Ave., #5005, is listed for $630/month. In the apartment, expect hardwood floors, wooden cabinetry, a ceiling fan, a dishwasher and a balcony. The complex offers a swimming pool, outdoor space and a fitness center. Cats and dogs are not welcome. Here's a one-bedroom, one-bathroom apartment at 2909 Hayes Road, #2611, which is going for $685/month. In the unit, look for hardwood flooring, air conditioning, wooden cabinetry, a breakfast bar and a dishwasher. The complex provides a swimming pool and assigned parking. Pets are not permitted. Then there's this apartment with one bedroom and one bathroom at 2828 Rogerdale Road, #3629, listed at $687/month. In the apartment, you'll find tiled floors, wooden cabinetry and a dishwasher. The building has outdoor space, a swimming pool and a lounge. Pets are not allowed here. This one-bedroom, one-bathroom condo, situated at 3900 Woodchase Drive, #60, is listed for $850/month for its 612 square feet of space. 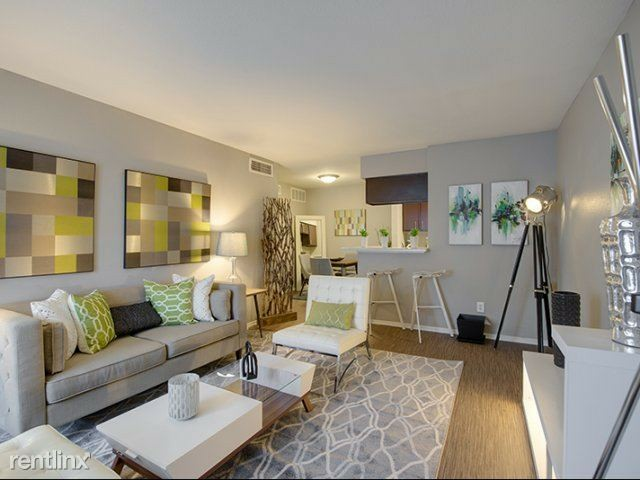 In the unit, anticipate air conditioning, tiled flooring, a fireplace, a dishwasher, in-unit laundry and a ceiling fan. Amenities offered in the building include assigned parking, a swimming pool and outdoor space. Pet owners, inquire elsewhere: this spot doesn't allow cats or dogs. Finally, over at 2727 Elmside Drive, #2855, there's this one-bedroom, one-bathroom apartment, going for $920/month. The apartment has air conditioning, hardwood flooring, wooden cabinetry, stainless steel appliances, a dishwasher and a ceiling fan. The complex boasts a swimming pool, outdoor space, a lounge and a fitness center. Pet owners, look elsewhere: this complex doesn't allow dogs or cats.